This dish is easy, quick and delivers more flavor than it should for so little work. One tip though, tuna is a fish that you don’t want to overcook, so be sure you have a nice, fresh piece of fish to begin with, give it a quick sear and leave it very rare. Think sushi. I served this with lemongrass creme fraiche, carrot puree and sauteed beet greens. Take tuna out of fridge and if you have time, let them come to room temperature. Dry with a paper towel and set aside. Heat a small pan over medium heat and toast coriander seeds until fragrant. Pound into a coarse powder. Add salt and pepper to taste and combine with coriander. Brush tuna lightly with olive oil and coat with coriander mix. I do this by spreading the coriander mix on a plate, then place the tuna pieces on the coriander mix and turn them over to coat both sides. Heat a large saute pan over high heat for 2 minutes. (If your pan isn’t big enough for all the tuna, do this in batches) Pour in 2 tbsp olive oil and heat for 1 more minute. The pan and oil should be really hot to get a nice sear on your tuna. Place your tuna carefully in the pan and sear for about 30-60 seconds. Shake the pan, the tuna should release and then you can carefully flip over and sear for another 30-60 seconds on the other side. Do not overcook the tuna! You want a nice sear on the outside and pink on the inside. Remove from the pan. 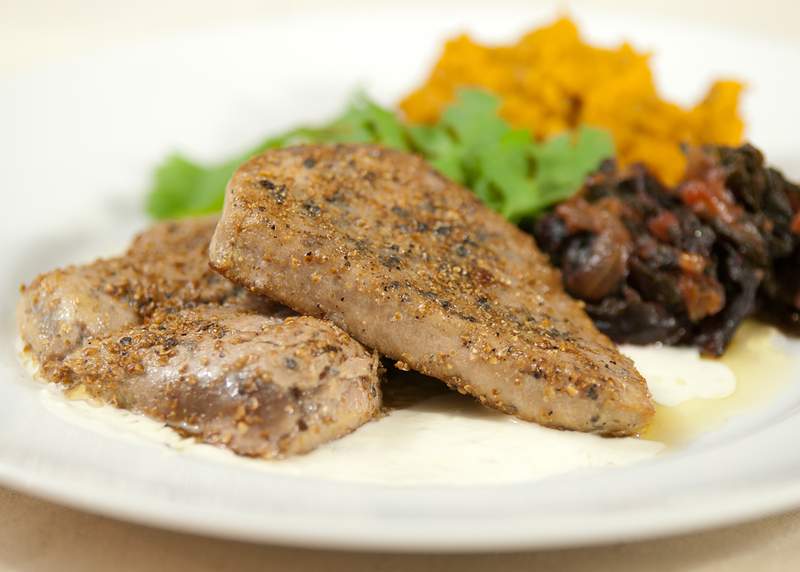 Serve by placing a tablespoon or two of the lemongrass creme fraiche on the plate and placing the tuna on top. This entry was posted in main dish, Posts and tagged coriander, tuna.